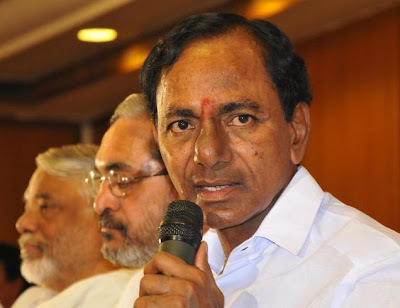 The TRS president K. Chandrasekhar Rao on Sunday voiced his opposition to to any proposal making Hyderabad a permanent joint capital of Telangana and Andhra Pradesh or a Union Territory. Mr. Rao said the administration of Hyderabad should be run by the Telangana government. “TRS would have no objection if the new Andhra Pradesh government runs its administration from Hyderabad till a capital with necessary infrastructure is built, but the administration of Hyderabad should be run by the Telangana government,” he said. The TRS president was speaking at a meet the press programme organised by the Telangana Journalists Forum. While giving its nod to the creation of Telangana state out of Andhra Pradesh last week, the Congress Working Committee (CWC) has proposed that Hyderabad will be the joint capital of the newly-proposed state and the other regions -- Rayalaseema and Andhra -- for a period of 10 years. With no major city in the Rayalaseema and coastal Andhra regions having the necessary infrastructure to be the capital of the new Andhra Pradesh state, some leaders from the two regions have favoured making Hyderabad a UT or permanent capital of the two states. Mr. Rao also denied having made remarks that employees from Andhra have no option but to go back to their native region post-bifurcation that caused a furore. “Who asked you to go? You will do your administration. You run (administration) for 10 years (as said by Congress). You retire here and buy a flat and be here. We have no objection. We never curse people. We only curse people who curse people,” he said. He, however, alleged that Telangana has suffered a lot in terms of jobs, availability of water among other things in a united Andhra Pradesh. The TRS president also said that red carpet welcome would be extended to those who wish to make investments in Telangana. “The Telugu film industry, based in Hyderabad, would also be encouraged to grow,” he said. Mr. Rao also said that he would like to see a Dalit leader as Chief Minister of Telangana if TRS gets majority and that he would like to head a “state advisory commission”. The passage of Telangana bill is important before taking a call on the possible merger of TRS with Congress, he added. About the development of Telangana after the formation of separate state, the TRS chief said he would “like to see smiles on the faces of all”. 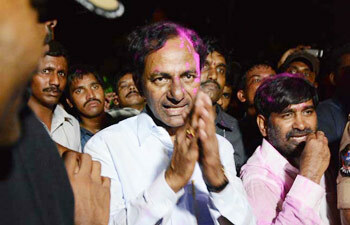 K. Chandrasekhara Rao greets supporters in Hyderabad. Kalavakuntala Chandrasekhara Rao, 59, the man who fought a bitter 12-year political struggle for a separate Telangana state, was not sure that his battle was about to end. On July 30, KCR, as the founder president of the Telangana Rashtra Samithi (TRS) is popularly known, remained closeted in his Telangana Bhavan office for four hours. 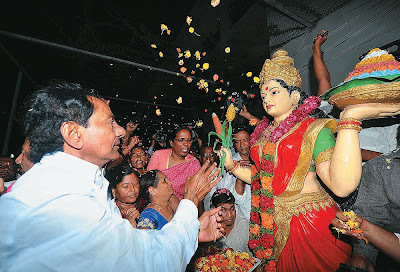 The MP from Mahbubnagar whose 11-day fast unto death in 2009 forced the UPA to first announce statehood, was bewildered by the swift political endgame in the Capital that created the new state within hours. First UPA endorsed the statehood decision, then, a few hours later, the Congress Working Committee (SWS) green-lighted it. India's fourth largest state would jointly share its capital, Hyderabad, with Andhra Pradesh. KCR stepped out of his office to offer a guarded reaction only after Digvijaya Singh, Congress general secretary managing Andhra Pradesh affairs, announced the formation of India's 29th state. 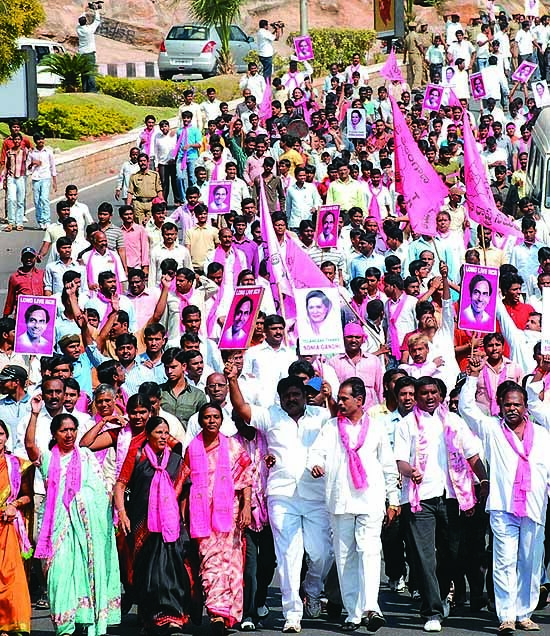 "We have to be cautious until Parliament enacts an appropriate legislation for the state," said KCR, not allowing himself to be overwhelmed by the clouds of pink and crowds of supporters who had broken into riotous celebration. "It's like a dream come true," Ponnam Prabhakar, Congress MP from Karimnagar, said in New Delhi. "I never thought I would see it in my lifetime." Clearly, it was not just trs that was taken by surprise. Here's what India's 29th state will mean for players in the fray in the next Lok Sabha elections. "Dividing Andhra Pradesh is for the welfare of the people and not for any political expediency," Digvijaya Singh said on July 30. But the Congress's Telangana plan is simple. Andhra Pradesh voted in the two largest blocks of Congress MPs, 29 in 2004 and 33 in 2009. It laid the foundations for UPA 1 and UPA 2. 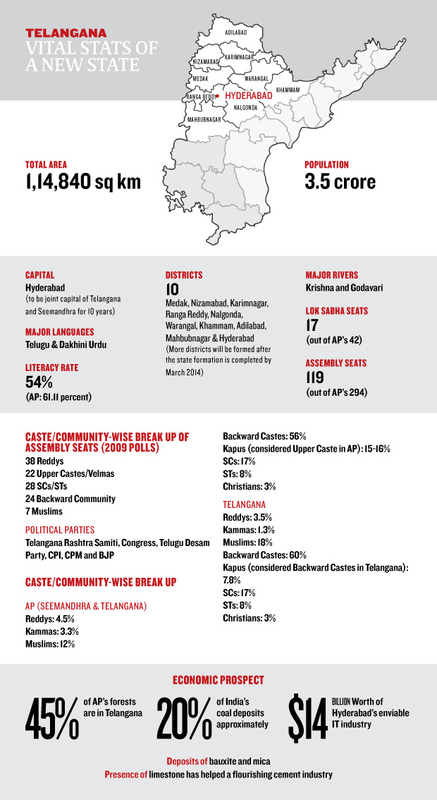 Faced with a near-total rout in 2014, the party, in an alliance with TRS, hopes to sweep Telangana's 17 Lok Sabha seats. The party hopes to corral N. Chandrababu Naidu's Telugu Desam Party (TDP) and Y.S. Jagan Mohan Reddy's ysr Congress in coastal Andhra Pradesh where it hopes to gain at least five Lok Sabha seats. Neither YSR Congress nor TDP has been able to consolidate its position in coastal Andhra and Rayalaseema regions which have a total of 25 Lok Sabha and 175 Assembly seats. The Srikrishna Commission report of 2011, appointed by UPA to suggest a way out of the Telangana imbroglio, recommended a separate state. But with a caveat. Because, "while creation of Telangana would satisfy a large majority of people from the region," the report said, "it would also throw up several serious problems." The Congress decision, driven by pure political survival instinct, came without studying the larger economic and political costs. It ignored home ministry assessments warning of a revival of Naxalism in the new state, the billions of rupees coastal Andhra Pradesh would spend on a new state capital when it moves out of Hyderabad, and recent Intelligence Bureau (IB) assessments warning of public outrage opposing division. 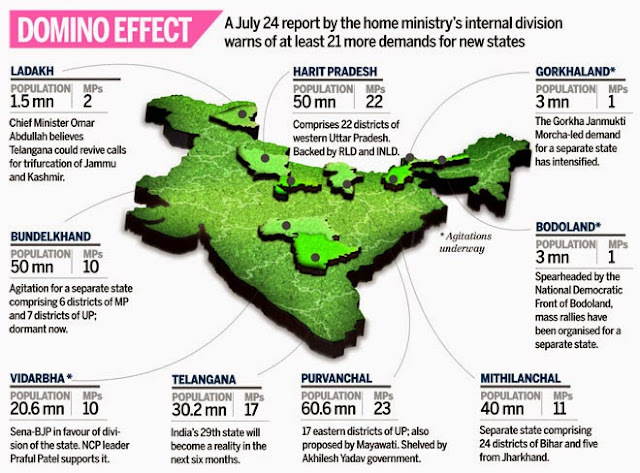 A July 24 report by the home ministry's internal division warns of at least 21 more demands for new states. But the biggest fear, a home ministry report of July 24 warns, is of "unrest and prolonged agitations" in other states including Uttar Pradesh, Assam, West Bengal and Maharashtra, where people have been demanding new states. Even before CWC took its final call, Gorkha Janmukti Morcha (GJM) called for a 72-hour shutdown in Darjeeling in support of Gorkhaland. In Maharashtra, BJP and Shiv Sena braced themselves to raise the issue of a separate Vidarbha. In Uttar Pradesh, Mayawati upped the ante for carving four states out of Uttar Pradesh. Andhra Pradesh was the first state created on a linguistic basis when the Telugu-speaking areas of erstwhile Hyderabad state were merged with Andhra state in 1956. Experts predict Telangana could spawn secessionist trends. "This thoughtless decision may lead to a demand for a separate Telugu nation, the 17th largest in the world," says political commentator C. Narasimha Rao. The home ministry report says Telangana could become a bastion for India's gravest internal security threat, the Maoists. The new state, "could become an easy target, considering its proximity to the worst-affected regions of Chhattisgarh's Bastar district and Maharashtra's Gadchiroli district", it notes. Twelve of the 15 members of the Maoists' central committee hail from the new state. The Maoists were driven out of the state by the Andhra Pradesh Police a decade ago. The report predicts Maoists could infiltrate again, taking advantage of the six months it will take to create Telangana. The Maoist bastion threat is also a scenario advanced by Chief Minister N. Kiran Kumar Reddy who is opposed to the division. The state police, however, say that in the Telangana districts, the few incidents have been restricted to five sub-divisions in Khammam and Warangal. "Andhra Pradesh is a role model for the rest of the country in fighting Maoists with an exclusive commando force and intelligence-gathering mechanism," explains Andhra Pradesh dgp V. Dinesh Reddy. There are apprehensions that the demographic changes could result in communal flare-ups. All India Majlis-e-Ittehadul Muslimeen (AIMIM) is opposed to the division. "Creating Telangana is going to help only bjp in the long run," says AIMIM president and Hyderabad Lok Sabha MP Asaduddin Owaisi. The party, which has seven MLAs, is wary of its diminishing administrative clout in Hyderabad. 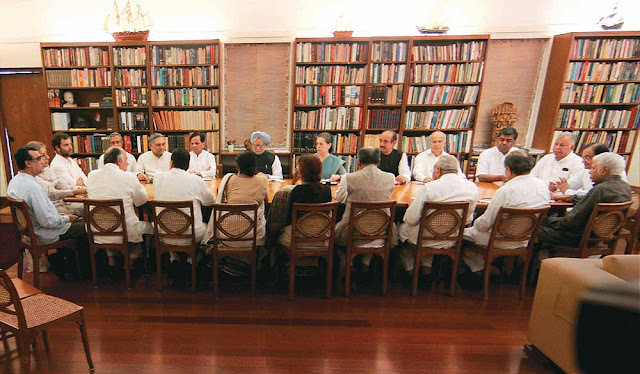 Manmohan Singh and Sonia Gandhi at the CWC meeting. Creation of new states means the Centre has to provide funds to develop infrastructure. Chhattisgarh is spending Rs.20,000 crore to develop its new state capital, Naya Raipur, besides other administration-related costs. A new capital for Andhra will cost much more unless both states agree to function from Hyderabad. Other investments will include sharing of water and natural resources. This was the reason why Congress leaders such as Union Science and Technology Minister S. Jaipal Reddy endorsed the now-aborted idea of including Kurnool and Anantapur districts in the new state. Telangana would then have the Srisailam dam and reservoir on the Krishna river, and the 1,670 mw hydel station. Unmindful of the consequences, Congress is working on a plan that will please its dynasts. Digvijaya Singh has set a 215-day timeline to complete the formation of the state. The process for creating a separate state will be initiated on August 20-Rajiv Gandhi's birthday-and given a concrete shape by December 9-Sonia Gandhi's birthday. The decision to split Andhra has horrified the united Andhra 'Seemandhra' supporters within Andhra Pradesh. P.V. Satish Kumar, MLA from East Godavari district, sent his resignation to the Assembly speaker within hours of the Telangana decision. Bandhs were called in coastal Andhra and Rayalaseema. Seemandhra leaders say they are worried about what will happen to them in Hyderabad especially when the state eventually becomes the capital of Telangana. 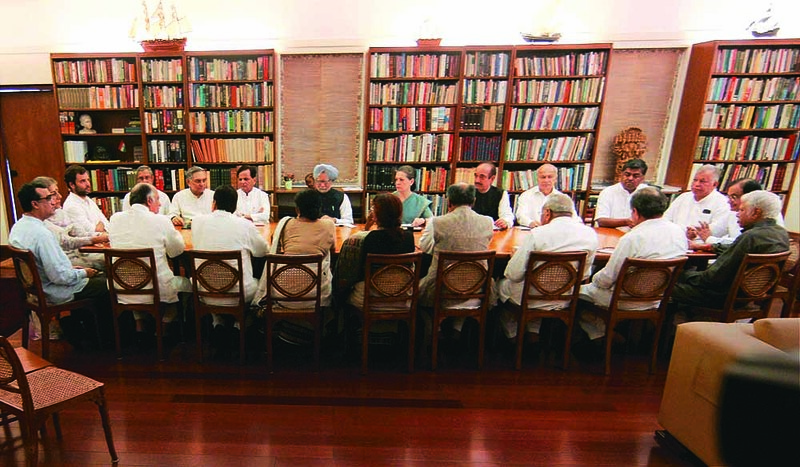 Several Congress leaders feel betrayed by the bifurcation. "We have paid a terrible price for trusting one family," says another Seemandhra MLA. There are indications that their discontent could spiral into a landslide of resignations to scuttle the resolution on the new state in the Andhra Pradesh Assembly. Home ministry officials say they have readied a Plan B. In case of en-masse resignations, the home ministry will dismiss Kiran Kumar Reddy's government and impose President's Rule. Nothing, it seems, can now come in the way of statehood for Telangana. 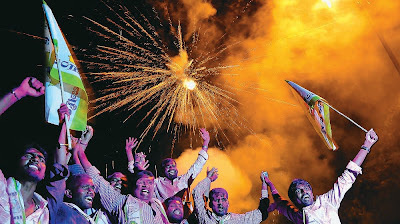 At 6.45 pm on 30 July, the first shouts of celebration were heard in front of the University College of Arts and Social Sciences at Hyderabad’s Osmania University. Students who were glued to TV sets in their hostel began running towards the avenue in front of the college as soon as the decision to create a new Telangana state was made public by the Congress Working Committee (CWC), the highest decision-making body of the Congress, which leads the UPA coalition. 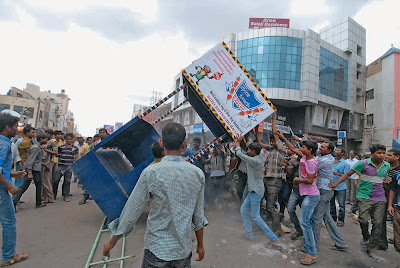 Nearly 500 students, who owed their allegiance to the Congress and the Telangana Rashtra Samiti (TRS), started bursting crackers, and throwing gulaal at each other, amid shouts of “Jai Telangana”. The Telangana movement, which rode on the feelings of victimisation, discrimination, cultural differences and a strong ethno-nationalistic sentiment for the past 44 years, was finally close to fulfilment. However, the jubilation did not mask the reasoned cynicism of the students. The question almost everyone had on their minds was: Will things actually change? “Sixty years of struggle. This is what we fought for,” said Krushank, a student leader of the Joint Action Committee (JAC) of OU, struggling to catch his breath. MCA students Suman and Fatima, who were among the handful of girls at the gathering, were more cautious. “We are happy that we have a state. But we don’t know whether things will change on the ground. Political parties may benefit. But will things change in the society and Osmania?” they wondered. Perhaps, this scepticism of the grand narrative was the main reason why celebrations were muted in much of Hyderabad, a city that has been at the heart of the movement. Telangana will comprise of 10 districts. Hyderabad, where businessmen and politicians from Andhra Pradesh have invested thousands of crores of rupees, will be the shared capital for the next 10 years, until a new capital for the residual AP is built. This came as a relief for pro-Telangana leaders and activists, who were anxious about the Congress’ plans of adding the non-Telangana districts of Anantapur and Kurnool and calling the new state Rayala Telangana. For a movement that reportedly saw over 900 suicides and self-immolations in the past four years, the climax came much less dramatically with the Congress’ electoral considerations — a desperate attempt to avoid completely losing the region — taking more airtime and column inches than the movement itself. 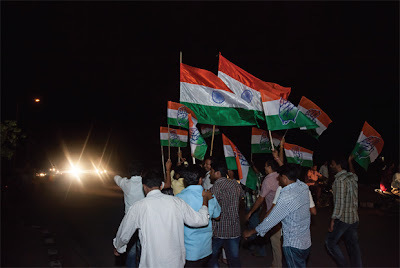 Meanwhile, in Seemandhra (the combined region of coastal Andhra and Rayalaseema), protests, mostly instigated by political parties, erupted in the districts of Anantapur, Vijayawada, Visakhapatnam, Chittoor and Tirupati. Schools and colleges in many towns along the coastal areas remained shut on 31 July, owing to bandh calls given by political formations such as the Seemandhra JAC, an amalgamation of parties fighting against the separation. Most Seemandhra supporters have questioned the necessity of Telangana, arguing that Rayalaseema has more poverty and fares worse in terms of social indices. Even though the formation of the state will not happen until next March, procedures have been set in motion. Whereas leaders from Seemandhra are hoping for the prospect of a favourable resolution in the Assembly rejecting the separation (because Telangana backers don’t seem to enjoy a majority support in the House), proponents of Telangana are confident that matters will end at the Parliament — where a resolution can be passed under Article 3, granting statehood. Even though many who have accepted the decision — like a section of the Congress, BJP and CPI — have welcomed the decision to keep Hyderabad as a common capital, BJP’s Venkaiah Naidu disgarees on that particular detail. “You can’t have a shared capital. That will be against the interests of the Andhra citizens who will have to cross a border to access their capital. The Congress needs to formulate an immediate plan for law and order in the city before anything else,” he says. Whereas Hyderabad is the biggest bone of contention, there are other issues such as the massive administrative intricacies involving names, office spaces and dizzying challenges of allocation of resources and sharing of power within Hyderabad. Telangana will also have to deal with several issues such as sharing water with Seemandhra, which is dependant on the Krishna, the longest river in south India, flowing from Mahabalweshwar in Maharashtra for more than 1,400 km before meeting the Bay of Bengal. “I think Telangana will benefit as it will have a bigger voice in keeping more water for itself as a state,” says Padmaja Shaw, an academic with the English and Foreign Languages University. Ashok Reddy, president (global HR and corporate affairs), Infotech Enterprises Ltd, says the decision has brought a much-needed end to the prevailing uncertainty. “It’s an emotional issue and there could be differences. The industry is neutral and appreciates that there’s no ambiguity now. We hope that the governments that come up will be investment friendly,” says Reddy, who is also the chairman of the Confederation of Indian Industries’ Andhra Pradesh chapter. However, many state Congress leaders are a miffed lot and are threatening to quit if the party goes ahead with the plan to create a new state. “I’m personally unhappy about the Congress granting Telangana. But as a party member, I will abide by the decision,” says Pradesh Congress Committee president Botsa Satyanarayana. In 2009, the Congress did have a favourable view on Telangana, but the matter was brushed aside. As the 2014 General Election looms large and as opinion polls and surveys show that the Congress is at its weakest, the party finally decided to bite the Telangana bullet. Clearly, the Congress realises that without Telangana on the map, its chances of coming back to power at the Centre would be close to nil. But the real story is slightly different. The first time the Congress had to seriously look into the Telangana issue was after the sudden death of the then chief minister, YS Rajasekhara Reddy, in a helicopter crash in September 2009. In December, the then Union home minister P Chidambaram had given a favourable statement, indicating that Congress was going to decide soon on Telangana. Chidambaram was criticised even by his own party colleagues and the matter was put on the backburner. After much agitation, the home ministry announced the formation of commission headed by retired Supreme Court judge, Justice BN Srikrishna. The commission report took almost a year to be submitted. Even though, the commission did not come out with a specific recommendation, it was largely seen as anti-Telangana. Meanwhile, YSR’s son Jaganmohan Reddy nursed ambitions of becoming the chief minister. The Congress wanted him to wait and offered him positions at the pcc level or at the Centre. But he wanted nothing but the top job. Low on patience, Jagan decided to rock the boat. He quit the party to start the YSR Congress. By 2011-12 Jagan’s new entity had started eroding the Congress party’s dominance in Rayalseema and Andhra regions. In late 2012, the Congress carried out an electoral assessment. The findings were startling. The party was facing major losses in Rayalaseema and Andhra to the TDP and YSR Congress. The story was no different in Telangana. The Congress MPs were getting desperate. They told the party leadership that it was almost impossible for them to visit their constituencies. The TDP, too, is putting up a brave face. Ramaiah goes on to claim that the TDP will side with neither the Congress nor the BJP, but instead will stick to a Third Front with the communist parties. Sources within the Congress party reveal that a decision to create the new state was on the cards as early as the end of 2012. The party was waiting for an appropriate time to announce the decision. In the past eight months, the basic job of the party’s national leadership has been to pacify, cajole and coerce the faction hailing from the non-Telangana areas to accept the Telangana decision. With crucial elections to both the Lok Sabha and the state Assembly less than a year away, the Congress deemed it fit to announce the creation of the new state. Andhra Pradesh has 42 Lok Sabha seats out of which the Congress won 34 in the 2009 election (12 of them came from Telangana). After the state is divided, 19 seats will go to Telangana while Andhra will retain the other 23 seats. The Congress hopes to sweep 90 percent of the seats in Telangana. In the residual Andhra Pradesh, too, the party hopes that its stalwarts will pull off a win in their respective constituencies. As a Congress insider puts it, it is better to win half the seats rather than lose everything. If the TRS merges with the Congress, the party will face virtually no electoral competition. In effect, this move has ensured that the Congress and the TRS will reign supreme in Telangana while in Andhra, the TDP and YSR Congress will divide the anti-Congress vote. Hence Congress is hoping to reap the benefits in both regions. How the elections play themselves out is a separate matter but this is the thinking prevailing in the Congress. Two days days before the CWC gave the final go-ahead saw hectic parleys in New Delhi. The United Andhra faction led by the Union HRD Minister MM Pallam Raju, a four-time mp from Kakinada in Andhra, knocked on all doors to stop the split from materialising. Several Central ministers from the Andhra region joined his endeavour. These included JD Seelam, Panabaka Lakshmi, Purandeswari, and Chiranjeevi. The group first met Digvijaya Singh to put its view across. Their face-saving formula was to have a discussion on the recommendations of the Justice Srikrishna Commission’s report in Parliament. But they were snubbed. They were later granted an audience with Sonia Gandhi but by then it was too late. “We will abide by the decision but we are worried about the developments. We have conveyed our concerns to the leadership,” says Raju. It was being said that Andhra Pradesh CM Kiran Kumar Reddy will resign before the announcement. After meeting Digvijaya Singh, Reddy said “the news of my resignation are all rumours.” Thus ending the last-ditch effort by the United Andhra faction. The creation of Telangana has given hope to people in other regions who have been demanding separate statehood. The Congress mp from Nagpur in Maharashtra has shot off a letter to Sonia Gandhi demanding a separate state of Vidarbha in the northeast of that state. Congress mp Mukul Wasnik, too, raised the issue in the CWC. At the UPA coordination committee meeting, which unanimously decided in favour of Telangana, there were divisions initially. Farooq Abdullah of the NC went back in history on the pros and cons of division of states. Though he gave his nod, sources say he was not fully convinced. Demands for to carve out separate states of Gorkhaland in the north of West Bengal, Bundelkhand comprising some districts in southwest Uttar Pradesh and northwest Madhya Pradesh, and Harit Pradesh in west Uttar Pradesh are gaining steam. This was discussed at the UPA coordination committee meeting but the consensus was that everything will be decided at the appropriate time. The Congress has made its move. Now it’s waiting and watching to see how the other political parties counter this move electorally. The party feels that if demands for other states grow louder, it will trigger the option of constituting a States Reorganisation Commission, which would be only the second since India’s independence from British rule in 1947. But first the Congress needs to ensure that problems in Andhra Pradesh and Telangana are ironed out smoothly. More jobs, plum posts in the government and private sectors and better education. All this will now come their way, feel the Telanganaites, given that the region’s most developed city, Hyderabad, will be the joint capital for both states for 10 years, by which time Andhra Pradesh has to build one of its own. And herein lies the heartburn. Hyderabad’s transition to Cyberabad took place under the chief ministership of Telugu Desam Party supremo Chan­drababu Naidu from 1995-2004. It began with the IT boom and today HiTec City is home to IT giants like Google, Microsoft, Dell, Oracle, TCS, as well as other biggies like Deloitte, Accenture, HSBC, Bank of America, Facebook and Amazon, among others. With the booming IT sector came high salaries, highrises, shopping malls and multiplexes, fuelling the real estate and retail sectors. A boom in the biotechnology, pharmacy and health sectors followed, leading to rapid growth between 1999 and 2008. With its superior infrastructure and thriving climate of opportunity, the 650 square kilometre metropolis came to be the dream job destination for youth from rural areas of both Telangana and Seemandhra. Ravindra Goda, a government bank employee in Vizag, just cannot understand why Hyderabad should be gifted to Telangana when both “Seemandhra and Telangana have hel­ped develop it”. Niranjan Reddy, MD of advertising agency AIM Vyapti Advertising, hails from Kadapa (in Rayalaseema), studied in Vijayawada (coastal Andhra), and opened up his business in Hyderabad. Calling himself an “all-region” man, he says it is impossible to develop another capital in 10 years. “Investors wouldn’t know where to invest once there are two states. It’s like hitting the restart button.” He predicts a fall of at least 20 per cent in the retail and real estate sectors in the coming years. A shared Hyderabad is causing some grief in Tollywood too. The epicentre of the Telugu film industry, the city boasts studios such as Ramoji Film City, Annapoorna, Rama Naidu, Saradhi and Padmalaya and is home to most Telugu stars and filmmakers. Though 50 per cent of Tollywood’s revenues come from what is called the Nizam territory (Telangana districts), the film ind­ustry is ruled by coastal Andhra and Rayalaseema. Daggubati Suresh, film producer and brother of star Venkatesh, rues that the Telugu people have lost their political voice. 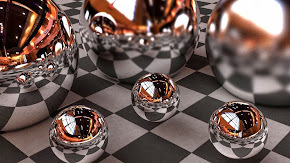 “Smaller pieces find it difficult to survive since there are no economies of scale. We’ll have to live with whatever’s given and hope the Telugu film industry stays united,” he says. Telangana Joint Action Committee chairman M. Kodand­aram admits having a common capital will remain a bugbear. But the wei­gh­tier concerns of power generation and supply or of water-sharing will be easier to address, he feels, because previous committees have looked into them. It was Jawaharlal Nehru who had described the 1956 merger of Telangana with Rayalaseema and coastal Andhra as the marriage of a reluctant bride. The States Reorganisation Commission had advised against the move, on grounds that the people of Telangana would be swamped by those from the coastal regions. But Andhra Pradesh came into being, with a gentleman’s agreement of special safeguards for Telangana. Intermittent agitations for the honouring of those safeguards came to naught. Finally, for a struggle which for long was also a fight against feudalism, it took an upper-caste Vel­a­ma, K. Chandrasekhara Rao, to set up the Telangana Rashtra Samiti in 2001, and his 10-day fast in 2009 for the Telangana agitation to pick up steam and force then home minister P. Chidamba­ram to make an announcement on Dece­mber 9 of that year and for the Congress now to give it shape. Of course, the political expediency of the move is not lost on anyone. With opinion polls predicting a sweep for Jagan­mohan Reddy in Seemandhra and a TRS surge in Telangana, not to forget Narendra Modi’s impending visit to the state this month to try and open a BJP account, the timing was just perfect for the Congress to pull the Telangana rabbit out of the hat. KCR and his party, for one, are stumped. Statehood was their plank, and the Congress has thrown it out with this ace. Why, it had been banking on the electorate’s resentment against the Congress’s wavering stance on the issue. So, while he welcomed the announcement, KCR said he will celebrate only when the bill is finally passed in Parliament. The party plays coy on any talk of a merger, and its leaders such as Shravan Kumar and T. Harish Rao continue to bat for KCR, comparing him to Nelson Mandela and calling him Telangana’s ‘jaati-pitah’. “KCR is the true architect of Telangana,” says Harish Rao. Jaganmohan may have lost some ground in Telangana, what with him asking 16 of his MLAs to resign a couple of days before the CWC meet over the united Andhra issue. However, political analysts say that having a steadfast stand will help Jagan win more seats in Seemandhra. Telangana politics also has a caste spinoff. It complicates the scenario for the Reddy community, who dominated the state’s power elite for ages, by splitting their bases in Telangana and Rayalaseema. (The attempt to include Anantapur and Kurnool, both Rayala­seema districts, in Telangana was a bid to prevent this.) The new Andhra will be left as a battleground for the Kapus and the Kammas (whom Naidu’s TDP represents). However, the TDP may also pose a problem for the Congress with the support base it has among the 44 per cent OBCs in the 10 districts of Telan­gana. Despite voting patterns chan­ging over the years, this lot has remained with the TDP since the days of N.T. Rama Rao who brought several of them into leadership posts allowing them to take on forward castes like the Reddys and Velamas. The OBCs inc­lude castes such as Mat­syakarulu, Nayi Brahmins, Rajakulu, Shilpakalu, SC Christ­ian converts, Gouds and Yadavas, of which the latter two are the most articulate in the statehood movement. Forced, therefore, into a delicate balancing act, it was a tame Naidu who addressed the media a day after the Telangana announcement. The Telugus, he hoped, would remain united even if division was inevitable. He also asked for a Rs 4-5 lakh crore package to dev­elop a new capital in Andhra and sought national status for the Prana­hita-Chevella irrigation project in Telangana. Anti-division agitations, however, continued to rage in Kur­nool, Anantapur, Vijayawada, Guntur, Visakhapatnam, Kadapa and other areas, with leaders caught between the angst of their people and the firmness of the high command. Resignations have become the order of the day and Seemandhra is catching on the disturbing trend of suicides. Vijayawada MP Lagadapati Raja­gopal, a strong unity proponent, says the game isn’t over yet. “All the Seemandhra MPs will vote against the bill in Parliament and keep the state united at all costs,” he says. The Congress’s eyes, however, remain firmly fixed on the fringe benefits. Telangana has 17 Lok Sabha seats and 119 assembly seats. Should there be a TRS-Congress coalition/merger, it can aspire to the magic figure of 60 assembly seats and 12-14 LS seats. And in Seemandhra, which has 25 LS seats and 175 assembly seats, the simple majority is 80. The Congress currently holds 97 seats here but with a Jagan sweep forecast, it would need to have a post-poll truck with YSR Congress. Chandrababu Naidu’s seven-month-long padayatra has kept party flock together. But he has lost a lot of ground in Seemandhra with his letter of support for Telangana. Many United Andhra supporters feel had he stayed silent, CWC wouldn’t have given decision on Telangana. Since it was BJP which first said it was going to give Telangana if voted to power, it has some support. Modi’s rising popularity is also going to reflect well for party. However, Telangana’s 12.4% Muslim voters would not want to have anything to do with the saffron party. MIM has been trying to expand its base in some districts in Telangana; might just increase tally in assembly. The Owaisis retain might in the Old City. The MIM has had differences with the Congress and Akbaruddin Owaisi’s imprisonment over a hate speech only widened the gap. The rebellion among the Seemandhra leaders might subside as even star batsman-CM Kiran Kumar Reddy now accepts that a division is certain. But it would be difficult for the ruling party to retain its numbers in Seemandhra unless it has some kind of a poll tie-up with Jagan. The resignation of 16 MLAs on the eve of announcement has made clear Jagan’s stand. 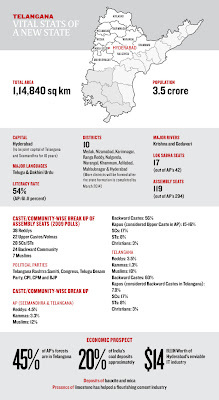 The party is all set for huge gains in Seemandhra but in Telangana, it would be completely alienated. If the division does come through, Jagan would have to completely forgo the Telangana region. Headquarters of Prakasam district, it has lots of vacant land and good rail and road connectivity. Yet to get an airport but has a port. Known for its agriculture and granite industries. Among the minuses: no great infrastructure in place and no major rivers in the district. Ongole is a water-scarce city but it is being floated as a possible capital of the new state. Commercial and business hub of Andhra region. Located on the banks of the Krishna river. Fertile soil and so agriculturally rich. Known for its automobile parts, garment and hardware industries. Has an airport at Gannavaram and is close to Machilipatnam port. Just a 5-hour drive from Hyderabad, but is already developed to the maximum possible limit; expansion difficult. The beautiful, cosmopolitan port city is at the state’s eastern corner, along the Eastern ghats. It has steel, petroleum, fertiliser industries and a shipyard. The Eastern Naval Headquarters is located here. It has an international airport, and is well connected by road and rail. It has several engineering and management colleges, and Andhra University. Previously, capital of Andhra State from 1953 to 1956. Lies on the banks of Tungabhadra river. Has quite a few colleges. Considered the gateway to Rayalaseema. Houses the famous Balaji temple at Tirumala, one of the world’s richest temples and the Tirumala Tirupati Devasthanam, a rich trust board. Touristy place, with high floating population. Surrounded by hills, making expansion difficult. Close to Chennai. Located in Chittoor district and education hub of AP. Well connected by air, road and sea. The Congress is at a T-junction, and not just in Andhra. The go-it-alone strategy of ’09 takes a backseat. How the Congress is trying to blunt the BJP edge? Reading tea leaves involves a set process: the person searching for answers drinks from a cup of tea, leaving a few drops of the liquid at the bottom. The cup is taken by the ‘reader’ who interprets the meanings of the accidental symbols formed by the soused tea leaves left behind. Rationalists dismiss it as hocus pocus but believers say there is a divine message in the dregs. It’s hard to come to instant answers in the jumble of politics, geography, sentiment and expediency that defines Tel­an­gana. There are no dregs here, but there is a divided state. What will be left behind may be bushfires that will take a while to burn out. The T-card has been played by the Congress in a blur of swift moves that should inevitably set in motion events that create the new state of Telangana. Because it is to be carved out of Andhra Pradesh—which gave the ruling party its single largest contingent of MPs in the current Lok Sabha—and also because it has been done in the run-up to a general election, there are political calculations at work although the end results are difficult to divine. Zoom out from the micro picture of Andhra to the country as a whole and another trend becomes clear. The Congress has changed its core strategy from what it followed in 2004 and 2009. Then it believed in going it alone to test the waters. Then it had attempted to rebuild bases in the heartland states where earlier polls had redu­ced it to being a marginal player. From whatever is understood of Rahul Gandhi’s political philosophy, it certainly involved att­empting to keep some distance from the parties that emerged from the churn in the post-Mandal era. Rahul had always believed that the Congress was in competition for ele­ctoral support from the same social segment as these parties. The bottomline is this: the Congress strategists know it is a question of minimising losses and preparing a strategy for an eventuality where the BJP could just be a nose ahead in the race to be the single largest party in 2014. They want to be prepared for what comes after the result is declared in May 2014 (if polls are on schedule). Hence, in 2013 the Congress has no plans to foolishly go it alone in Bihar but is weighing the choice of going with either Nitish Kumar’s JD(U) or Laloo Prasad Yadav’s RJD. Sources in the party say it is a close call, but Sonia Gandhi may eventually settle for Laloo as she is said to have a personal soft corner for him. He also represents one polar position on the secular-non-secular binary that is bound to come into play in an election where Modi will be giving it his all. The Uttar Pradesh strategy is yet to be worked out as the political situation is fluid and although there is talk of the Congress trying to ally with the BSP or SP, it is not clear what the regional powerhouses would want to extract from the national party. While more pre-election alliances should be worked out, the second part of the strategy involves the post-result scenarios. So it’s not just Andhra Pradesh that stands at a T-junction. The Congress obviously expected to create a storm in the tea cup of the state, and even temporarily resuscitate old demands for small states across India. The party decision-makers believe that when the dust settles at least two players of the region will be in positions where they would have little choice but to make post-election alliances with the Congress. But it’s not quite as simple. In 1998, the BJP powered by the Atal Behari Vajpayee had 18 per cent of the vote in Andhra Pradesh. In 1999 and 2004, the BJP and TDP struck pre-poll alliances although the latter never formally joined the NDA at the Centre. Since that time, both parties have been in decline in Andhra although the BJP’s stock has fallen more dramatically. The Congress’s, meanwhile, both rose and fell. Now new players are on the scene. The boundaries are shifting, both literally and metaphorically. One can even argue that no other state has witnessed such dramatic changes in the fate of so many significant political forces. Andhra Pradesh could indeed become the marker for the national chaos and the calculus of impossible arithmetic as we now pick up speed and begin to race towards yet another general election and the campaigns and strategies that precede it. The Congress Working Committee's historic resolution to create India's 29th State — Telangana — by partitioning Andhra Pradesh redeems a pledge the party made to the people of the region on the night of December 9, 2009. Compared to the Congress's flip-flop earlier, its present resolve to fast forward Telangana when the Lok Sabha election is barely 10 months away lays it open to the charge of political expediency. But what matters now is that the people of Telangana are celebrating the decision, which they see as crucial to the fulfilment of their social, economic and political aspirations. As much as the formation of Telangana is a source of joy to its people, the bifurcation is a cause for despondency to those living in coastal Andhra and Rayalaseema. Though a separate Telangana State was first conceived in 1953, the fact that the region spoke the same language as Rayalaseema and Coastal Andhra became the basis for the formation of India's first linguistic State when a unified Andhra Pradesh was created in 1956. What followed, unfortunately, was a saga of unkept promises, violation of the Gentlemen's Agreement of 1956, and two violent agitations in 1969 and 1972. Slowly, a feeling built up among the people of Telangana that they were being discriminated against in employment and education. These wrongs will hopefully be set right when Telangana begins its tryst with destiny soon. Without much ado, the Congress has cut the Gordian knot that was Hyderabad's status by deciding to make it the common capital of Telangana and Andhra Pradesh, for a period of 10 years. Seemandhra will receive Central assistance for building a new capital, and the classification of Polavaram — a massive multipurpose irrigation venture — as a national project will help protect the "rump" Andhra Pradesh's interests. What is a source of worry, however, is that the CWC resolution leaves slightly open-ended the question of whether Telangana will have 10 districts or 12, with the addition of Kurnool and Anantapur in Rayalaseema. There will be other practical difficulties too but the political and civil society leadership of Telangana and Andhra Pradesh must shun regional chauvinism and violence and grasp with both hands the great future that lies ahead of them. If the Congress has opened a Pandora's box by giving an impetus to similar demands for statehood in Gorkhaland, Bodoland and elsewhere, the party must draw lessons from its chequered handling of the Telangana question. Instead of finding ad hoc solutions to crises as and when they erupt, serious thought must be given to the creation of a second States Reorganisation Commission that will take a structural approach to the problem. இந்தியாவின் 29-ஆவது மாநிலமாக தெலங்கானா உருவாக்கப்படுவது ஆளும் மத்திய கூட்டணி அரசால் உறுதி செய்யப்பட்டு விட்டது. 2009 மக்களவைத் தேர்தலின்போது தெலங்கானா மக்களுக்கு அளித்த வாக்குறுதியை, அடுத்த மக்களவைத் தேர்தல் நெருங்கும் வேளையில் நிறைவேற்ற முற்பட்டிருக்கிறது காங்கிரஸ் தலைமை. இந்த முடிவு சரியா, தவறா என்பதை வருங்காலம்தான் தீர்மானிக்கும் என்றாலும்கூட, இந்த முடிவின் பின்னால் இருக்கும் அரசியலும், இந்த முடிவினால் தேசிய அளவில் ஏற்பட இருக்கும் பின்விளைவுகளும் தவறுகளிலெல்லாம் பெரிய தவறு என்பதை வருங்காலம் உணர்த்த இருக்கிறது. இந்தியா சுதந்திரம் பெற்ற ஆறாவது ஆண்டிலேயே "தெலங்கானா' என்கிற தனி மாநிலக் கோரிக்கை எழுப்பப்பட்டது. சென்னை ராஜதானியிலிருந்து "தனி ஆந்திரம்' என்கிற கோரிக்கையும் தெலங்கானா கோரிக்கையும்தான், அன்றைய மத்திய அரசை "மாநில சீரமைப்பு ஆணையம்' அமைக்கத் தூண்டியது. அப்போது, மொழிவாரியாக மாநிலங்கள் பிரிக்கப்படும் என்கிற முடிவை எடுத்தபோது, தெலுங்கு பேசும் தெலங்கானா, கடற்கரையோர ஆந்திரம், ராயலசீமா பகுதிகளை உள்ளடக்கிய ஆந்திரப் பிரதேசம் என்கிற மாநிலத்திற்கு வடிவம் தரப்பட்டது. 1956-இல் ஆந்திரப் பிரதேசம் உருவானபோது, தெலங்கானா பகுதிக்கு பல வாக்குறுதிகள் வழங்கப்பட்டன. அவற்றில் எதுவுமே நிறைவேற்றப்படாத நிலையில்தான் 1969-லும், 1972-லும் தனித் தெலங்கானா கோரிக்கையுடன் மிகப்பெரிய போராட்டங்கள் நடைபெற்றன. தெலங்கானா பகுதி மக்கள் கல்வியிலும் வேலைவாய்ப்பிலும் பின்தள்ளப்படுகிறார்கள் என்பதும், தொடர்ந்து பொருளாதார வளர்ச்சியில் தெலங்கானா பகுதிகள் பிற்பட்டவையாகவே தொடர்வதும்தான் தெலங்கானா மாநிலக் கோரிக்கைக்குக் காரணங்கள். தெலங்கானா பகுதியில் மாவோயிஸ்ட் தீவிரவாதிகளின் எழுச்சிக்கும் இவைதான் காரணமாக அமைந்தன. மத்திய அரசின் இப்போதைய முடிவின்படி, அடுத்த பத்தாண்டுகளுக்கு இரு மாநிலங்களின் பொதுத் தலைநகராக ஹைதராபாத் இருக்கும். சீமாந்திரா மாநிலத்திற்கு என்று அந்த மாநில அரசு புதிய தலைநகரை உருவாக்கிக் கொள்ள மத்திய அரசு நிதி உதவி அளிக்கும். அதேபோல, "போலாவரம்' நீர்ப்பாசனத் திட்டத்தை மத்திய அரசு ஏற்றுக் கொள்வதன் மூலம் இரண்டு மாநிலங்களின் நலனும் பேணப்படும். பிரச்னைக்குரிய விஷயம், புதிய தெலங்கானா மாநிலம் 10 மாவட்டங்களை மட்டும் உள்ளடக்கியதாக இருக்கப் போகிறதா அல்லது கர்நூல், அனந்தப்பூர் ஆகிய இரண்டு மாவட்டங்களையும் இணைத்து 12 மாவட்டங்களுடனான மாநிலமாக இருக்கப் போகிறதா என்பதுதான். ஒய்.எஸ்.ஆர். காங்கிரஸ் தலைவர் ஜெகன்மோகன் ரெட்டியின் செல்வாக்குக் கேந்திரங்களான அந்த இரண்டு மாவட்டங்களையும் தெலங்கானாவில் இணைப்பதன் மூலம் அவரை சீமாந்திராவிலோ தெலங்கானாவிலோ பெரும்பான்மை பலத்துடன் ஆட்சி அமைக்க முடியாத நிலைமைக்குத் தள்ளிவிடலாம் என்பது காங்கிரஸின் எதிர்பார்ப்பு. இதுவேகூட இன்னொரு போராட்டத்துக்கு வழிகோலக்கூடும். மத்திய அமைச்சரவை தீர்மானித்துவிட்டதாலேயே "தெலங்கானா' மாநிலம் உருவாகிவிட முடியாது. மத்திய சட்ட அமைச்சகம், மாதிரி வரைவு மசோதா ஒன்றைத் தயாரித்து ஆந்திர மாநில அரசுக்கு அனுப்பி, அந்த மசோதா அம்மாநிலச் சட்டப் பேரவையால் விவாதிக்கப்பட்டு நிறைவேற்றப்பட வேண்டும். பின்னர் குடியரசுத் தலைவரின் அனுமதியுடன் அந்த மசோதா நாடாளுமன்றத்தின் இரண்டு அவைகளிலும் நிறைவேற்றப்பட்டு, குடியரசுத் தலைவரின் ஒப்புதலும் பெறப்பட்டு முறையான அறிவிப்பும் வந்த பிறகுதான் தெலங்கானா என்கிற மாநிலம் உருவாகும். அடுத்த பத்து மாதங்களுக்குள் இது சாத்தியப்படுமா என்பது தெரியவில்லை. பாஜகவின் ஆதரவு இருப்பதால் சாத்தியப்படலாம் என்றாலும்கூட, சட்டப் பேரவையில் தீர்மானம் நிறைவேறுவதில் சிக்கல் ஏற்படக்கூடும். கவலையளிக்கும் வேறு பல சிக்கல்களையும் உள்ளடக்கி இருக்கிறது மத்திய அரசின் முடிவு. பிரிவினைக்கு எதிரான போராட்டம் தெலங்கானா அல்லாத சீமாந்திரா பகுதிகளில் வலுத்தால், ஏற்கெனவே நக்சல் தீவிரவாதிகளுடன் போராடிக் கொண்டிருக்கும் துணை ராணுவத்தாலோ, பாதுகாப்புப் படைகளாலோ அதை எதிர்கொள்ள முடியுமா? அது போகட்டும். அசாமில் போடோலாந்து, மேற்கு வங்காளத்தில் கோர்க்காலாந்து, உத்தரப் பிரதேசத்தில் ஹரித் பிரதேஷ், பஸ்சிம் பிரதேஷ், புண்டல்கண்ட், மகாராஷ்டிரத்தில் விதர்பா, குஜராத்தில் சௌராஷ்டிரா, கர்நாடகத்தில் "கூர்க்', ஒடிசாவில் கோஷலாஞ்சல், பிகாரில் மிதிலாஞ்சல் என்று பல கோரிக்கைகள் காத்துக் கிடக்கின்றனவே, இங்கே எல்லாம் கிளர்ச்சிகளும் போராட்டங்களும் எழுந்தால் மத்திய அரசு அதை எப்படி எதிர்கொள்ளப் போகிறது? உத்தரப் பிரதேச சட்டப் பேரவையில் அந்த மாநிலத்தை பூர்வாஞ்சல், புண்டல்கண்ட், அவத் பிரதேஷ், பஸ்சிம் பிரதேஷ் என்று நான்காகப் பிரிக்கக் கோரி ஒரு தீர்மானம் 2001-லேயே நிறைவேற்றப்பட்டு, மத்திய அரசால் கிடப்பில் போடப்பட்டிருக்கிறது. அப்படி இருக்கும்போது இப்போது ஆந்திரப் பிரதேச சட்டப் பேரவையில் தீர்மானம் இல்லாமலேயே, அரசியல் ஆதாயம் தேடும் ஆசையுடன் மத்திய அரசு தெலங்கானா மாநிலம் உருவாக்கும் முயற்சியில் இறங்கி இருப்பது வேடிக்கையாக இருக்கிறது. எலியைக் கொல்வதற்குக் கோட்டைக்கே தீ வைத்த கதையாக ஒய்.எஸ்.ஆர். காங்கிரஸ் தலைவர் ஜெகன்மோகன் ரெட்டியின் செல்வாக்கை ஒழிப்பதற்காக தேவை இல்லாமல் தேசிய அளவில் பிரிவினைக் கோரிக்கைகள் எழும்புவதற்கு வழிகோலி இருக்கிறது காங்கிரஸ் தலைமை. உண்மையிலேயே, சிறிய மாநிலங்கள் மூலம் நிர்வாகத்தை மேம்படுத்துவதுதான் நோக்கம் என்றால் "மாநில மறு சீரமைப்பு ஆணையம்' அமைத்து முறையாக புதிய மாநிலங்களை உருவாக்குவதுதானே புத்திசாலித்தனம்? போராட்டங்களுக்கும், கிளர்ச்சிகளுக்கும், வன்முறைகளுக்கும் தூபமிட்டு, பொருளாதாரச் சிக்கல் என்கிற புதைகுழியில் விழுந்து கிடக்கும் மத்திய அரசு தனது கையாலாகாத்தனத்திலிருந்து மக்கள் கவனத்தைத் திசை திருப்ப முற்படுகிறதோ என்று எண்ணத் தோன்றுகிறது. அப்படி இருக்குமானால், இன்றைய ஆட்சியாளர்களை சரித்திரம் மன்னிக்காது! புவி அமைப்பு அல்லது மொழி, ஒரு மாநிலம் பிரிக்கப்படுவதற்கு அடிப்படையாக இருக்கலாம். ஆனால், அரசியல் அடிப்படையாக இருக்குமேயானால் அது புதிய பல பிரச்னைகளுக்கு வழிகோலுமே தவிர புதிதாக உருவாக்கப்பட்ட இரண்டு மாநிலங்களுக்குமே வளர்ச்சியையோ திறமையான நிர்வாகத்தையோ உறுதிப்படுத்தாது. மத்திய ஆளும் கூட்டணி, குறிப்பாக காங்கிரஸ் கட்சி, தெலங்கானா மாநிலம் அமைக்க முற்படுவது முழுக்க முழுக்க அரசியல் சார்ந்ததாக மட்டுமே இருக்கும் என்று தெரிகிறது. இதனால் மாநிலத்திற்கு வளர்ச்சி ஏற்படுமா என்பதைவிட காங்கிரஸ் கட்சியின் வெற்றிவாய்ப்பு அதிகரிக்குமா என்பதுதான் மத்திய ஆட்சியாளர்களின் கண்ணோட்டமாக இருக்கிறது. தெலங்கானா ராஷ்டிர சமிதி நிறுவனர் சந்திரசேகர ராவுடன் காங்கிரஸ் கட்சி ரகசிய உடன்பாடு ஏற்படுத்திக் கொண்டிருக்கிறது என்பது பரவலான எதிர்பார்ப்பு. அதன்படி தெலங்கானா மாநிலம் அறிவிக்கப்பட்டவுடன் சந்திரசேகர ராவ் தனது கட்சியைக் காங்கிரஸ் கட்சியுடன் இணைத்துவிடுவார் என்று எதிர்பார்க்கப்படுகிறது. இதை காங்கிரஸ், தெலங்கானா ராஷ்டிர சமிதி ஆகிய இரு கட்சிகளும் வெளிப்படையாக மறுத்தாலும்கூட அவர்களுக்குள் ஒரு ரகசிய ஒப்பந்தம் ஏற்பட்டிருக்கக்கூடும் என்றுதான் தோன்றுகிறது. அதன் மூலம் ஆந்திரத்தை காங்கிரஸ் இழந்தாலும்கூட புதிதாக உருவாக்கப்படும் தெலங்கானா மாநிலத்தில் அதன் வெற்றியை உறுதிப்படுத்துவது என்பதுகூட திட்டமாக இருக்கலாம். இன்றைய நிலையில் ஆந்திர மாநிலத்தில் காங்கிரஸ் கட்சியின் செல்வாக்கு கணிசமாக சரிந்துவிட்டிருக்கும் நிலை. தெலங்கானா பகுதியில் சந்திரசேகர ராவின் தெலங்கானா ராஷ்டிர சமிதியும், ஆந்திரப் பகுதியில் ஜெகன்மோகன் ரெட்டியின் ஒய்.எஸ்.ஆர். காங்கிரஸýம் செல்வாக்கில் முன்னணியில் இருப்பதாகக் கருத்துக் கணிப்புகள் தெரிவிக்கின்றன. 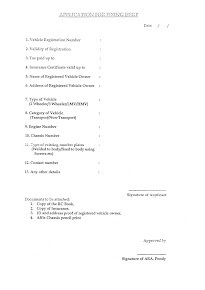 ஆந்திரப் பகுதியில் போட்டியே ஒய்.எஸ்.ஆர். காங்கிரஸýக்கும் சந்திரபாபு நாயுடு தலைமையிலான தெலுங்கு தேசம் கட்சிக்கும் இடையில்தான் என்பதும், தெலங்கானா பகுதியில் தெலங்கானா ராஷ்டிர சமிதிக்கும் ஒய்.எஸ்.ஆர். காங்கிரஸýக்கும் இடையில்தான் என்பதும்தான் நிஜ நிலைமை. அதனால்தானோ என்னவோ ஆந்திர மாநிலத்தின் ராயலசீமா பகுதியில் ஒய்.எஸ்.ஆர். காங்கிரஸýக்கு வெற்றி வாய்ப்பு உள்ளதாகக் கருதப்படும் இரண்டு மாவட்டங்களை தெலங்கானாவுடன் இணைக்க முற்பட்டிருக்கிறது மத்திய அரசு. இந்த இரண்டு மாவட்டங்களை தெலங்கானாவுடன் இணைப்பதன் மூலம் ஒய்.எஸ்.ஆர். காங்கிரûஸப் பலவீனப்படுத்துவது என்பதுதான் திட்டம். தெலங்கானா மாநிலம் அமைப்பது என்கிற முடிவுக்கு மத்திய அரசு வந்ததுமுதல் ஆந்திரப் பகுதியைச் சேர்ந்த காங்கிரஸ் கட்சியின் நாடாளுமன்ற, சட்டப்பேரவை உறுப்பினர்கள் கட்சித் தலைமையின் முடிவுக்கு மாறாகக் கருத்தை வெளிப்படுத்தி வருகிறார்கள். ஆந்திரப் பகுதியைச் சேர்ந்த மத்திய அமைச்சர்கள் உள்ளிட்ட நாடாளுமன்ற உறுப்பினர்கள் பிரதமரைச் சந்தித்து தெலங்கானா பிரச்னையில் அவசர முடிவு எதுவும் எடுத்துவிடக் கூடாது என்று கோரிக்கை விடுத்திருக்கிறார்கள். ஆந்திர முதல்வர் கிரண்குமார் ரெட்டியே கூட கட்சித் தலைமையின் முடிவுக்கு மாறான கருத்தை வெளிப்படுத்தி வருகிறார். இதற்கெல்லாம் காரணம் ஆந்திர மாநிலம் பிரிக்கப்படக் கூடாது என்பதைவிட தெலங்கானா, ஆந்திரம் ஆகிய இரண்டு தரப்பினரிடமும் பெயரைக் காப்பாற்றிக் கொண்டு அதன் மூலம் தேர்தலில் ஆதாயம் அடையலாம் என்பதுதான். புத்திசாலித்தனமாக "இரட்டை வேடம் போட்டு' அரசியல் ஆதாயம் பார்க்கும் உத்திதான் இது. சிறிய மாநிலங்கள் அமைவதில் தவறொன்றுமில்லை. அப்படி மாநிலங்கள் அமையும்போது அரசின் திட்டங்கள் எளிதாக மக்களைப் போய்ச் சேர்வதற்கும் அந்தத் திட்டங்கள் முறையாகச் செயல்படுத்தப்படுகின்றனவா என்பதைக் கண்காணிப்பதற்கும் வசதியாக இருக்கும். இந்த வகையில் பிரிக்கப்பட்ட சிறிய மாநிலங்களான ஹரியாணா, சத்தீஸ்கர் போன்றவை மிகப்பெரிய பொருளாதார வளர்ச்சியடைந்திருப்பதை மறுக்க முடியாது. அதேநேரத்தில் சிறிய மாநிலங்கள் அமைக்கப்பட வேண்டும் என்று எழும் கோரிக்கையை மட்டுமே அடிப்படையாகக் கொண்டு மாநிலங்களை அமைத்துவிடவும் முடியாது. தெலங்கானா மாநிலம் அமைக்கப்பட வேண்டும் என்கிற கோரிக்கைக்கு அவர்கள் முன்வைக்கும் இன்னொரு காரணம் ஆந்திர மாநிலத்துக்கான திட்டங்கள், நிதி ஒதுக்கீடுகள் அனைத்துமே தெலங்கானாவுக்குக் கிடைக்காமல் கடலோர ஆந்திரம் மற்றும் ராயலசீமாவுக்குச் சென்றுவிடுகிறது என்பதுதான். அதுமட்டுமல்லாமல் தெலங்கானா பின்தங்கிய பகுதியாகவே தொடர்கிறது என்பதும் தனி மாநிலக் கோரிக்கைக்கு வலு சேர்க்கும் வாதம். ஆனால், தனித் தெலங்கானா மாநிலம் அமையுமானால் அதனால் இந்த நிலையில் மாற்றம் ஏற்பட்டுவிடப் போவதில்லை என்பதை நாம் கருத்தில்கொள்ள வேண்டும். தெலங்கானா மாநிலம் அமைவதில் இன்னொரு பிரச்னையும் இருக்கிறது. மாவோயிஸ்ட் தீவிரவாதிகளின் பிடியில் தெலங்கானாவிலுள்ள பல பகுதிகள் உள்ளன. பலம்பொருந்திய பெரிய மாநிலமாக ஆந்திரம் இருந்தும்கூட சமாளிக்க முடியாத மாவோயிஸ்ட் பிரச்னையை சின்ன மாநிலமான தெலங்கானாவால் எதிர்கொள்ள முடியுமா என்பதுதான் அது. ஹைதராபாத், சண்டீகர் போல பொதுத் தலைநகராக இருந்தாலும்கூட மாவோயிஸ்டுகளின் பிரச்னையை எதிர்கொள்ளத்தான் வேண்டும். இப்படிப்பட்ட நிலையில் அவசரக் கோலத்தில் ஆந்திரத்தைப் பிரிப்பது உசிதமாக இருக்காது என்பதை பச்சைக்குழந்தை கூட தெரிவிக்கும். அப்படியானால் அரசுக்குத் தெரியாதா என்ன? மத்திய அரசின் நோக்கம் ஆந்திரத்தின் வளர்ச்சியோ முன்னேற்றமோ அல்ல. அடுத்த ஆண்டு வரவிருக்கும் நாடாளுமன்ற பொதுத் தேர்தலில் இரண்டு மாநிலங்களிலும் எப்படியாவது வெற்றிபெற்றாக வேண்டும் என்பதுதான். அதற்கு பகடைக்காயாக "தெலங்கானா' பயன்படுகிறது, அவ்வளவே!